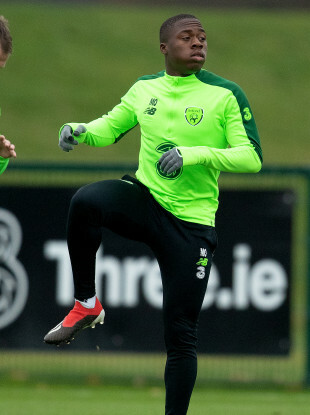 Michael Obafemi pictured in Ireland training during the week. MARTIN O’NEILL HAS emphasised the importance of not pressurising Michael Obafemi into making a definitive decision on his international future, while suggesting that the uncapped teenager could feature for the Republic against Northern Ireland this evening. The Irish boss said on Thursday that the 18-year-old Southampton striker, who is also eligible to represent England and Nigeria, was unlikely to travel with his squad to Denmark, despite receiving his first senior call-up earlier this week. Featuring in Monday’s Nations League match would mean the player would have to stick with Ireland for the remainder of his career, but Obafemi — who was born in Dublin to Nigerian parents and spent the majority of his upbringing in London — is understood to be still contemplating his international future. The 66-year-old coach suggested that even if Obafemi did declare himself available for the Danish game, he would be reluctant to pick him given the complexity of the situation. “I didn’t press him primarily because I didn’t get the opportunity to speak to his family,” the Ireland manager said. “I’m always hopeful [about him choosing Ireland], I’ve always said that. I’m hopeful about Declan Rice. But I can only be confident about something that I know that I’m in control of. I’m not in control of other people’s decisions, particularly issues like this, that are very important. “But he has really enjoyed the training, he did very well, and he’s got a lot of encouragement from staff and senior players, like Glenn Whelan and Seamus Coleman. So that sort of feeling has got to be good. Obafemi’s dilemma is one of a number of eligibility sagas that O’Neill has had to deal with since becoming Irish manager. Ex-Ireland U21 international Jack Grealish previously turned down a senior call-up, and ultimately declared for England, while West Ham’s Declan Rice is currently contemplating a similar switch, having represented the Boys in Green in three friendlies. Conversely, Ireland have also benefited from the eligibility ruling recently. Ex-Northern Ireland U21 international Michael Duffy has chosen to declare for the Republic, while Michael O’Neill compared the two sides’ international tug of war over Burnley defender Jimmy Dunne to the Rice scenario. Email “'Even if he does declare... Do I really want to go and do that, and then he changes his mind later?' ”. Feedback on “'Even if he does declare... Do I really want to go and do that, and then he changes his mind later?' ”.